A Huge Fiddleback spotted on a Lampshade Yesterday! 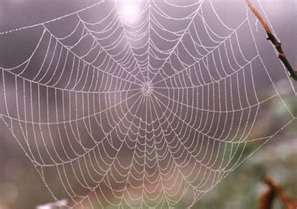 Most spiders live one season, however some species live long lives and spend the winter in a semi-hibernation. The Fiddlebacks have hidden in the rafters, behind the books, under the bed, and in other out of the way places and are emerge as spring is approaching. Over the Winter they have grown and shed last years 'shell' leaving behind the empty casing... the empty casing is a sign that a more mature one is lurking somewhere nearby. 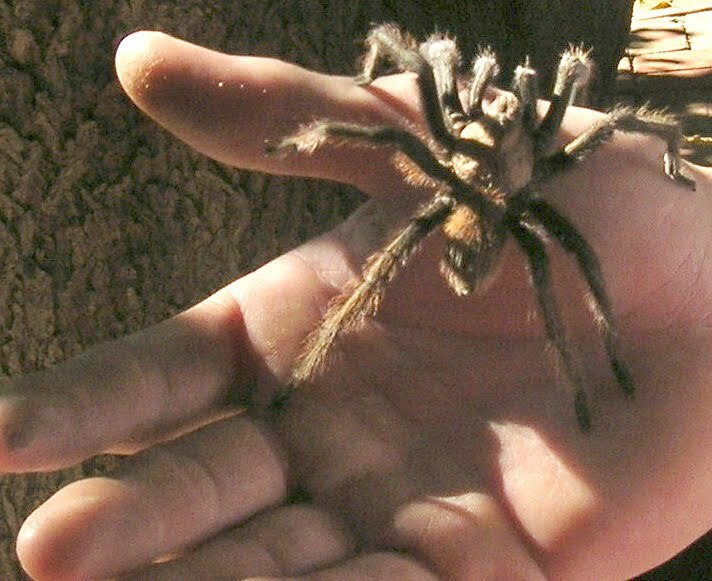 The gentle Tarantula has an extremely long life expectancy and will easily live up to 20 years in captivity. The record has been set by a female who resides in LA and although her age was unknown at the time of her capture, she is now fifty years old. Spiders are a most interesting invertebrate in both appearance and habit. All are predators which make them valuable to the gardener as they will eat flies, mosquitoes, grasshoppers, locusts, cockroaches, and aphids. The habits differ among species with some making intricate webs to trap their prey while some lie in wait on flowers and some simply travel about on the ground. Though not all spiders spin gossamer webs, spiders have been attributed by numerous cultures with the origin of basket-weaving, knot work, weaving, spinning, and net making. Lovely pottery artifacts featuring spiders may be found in all ancient cultures, so respect for them is universal. Any talk of spiders includes the two most dangerous in North America and they must be addressed. All spiders have venom however the Black Widow and Brown Recluse (Fiddlebacks) are very dangerous species whose bite may have disastrous effects on humans. The Brown Recluse likes living in quiet corners of the house while the Black Widow resides outdoors. A member of the Tangleweb family, both make an untidy web as the name implies and will aggressively guard their egg sacs. Both have thin legs and a fragile skeletal structure, making them easy to squish... do not hesitate to kill them. A favorite spider which comes to mind is the darling fuzzy black jumper. 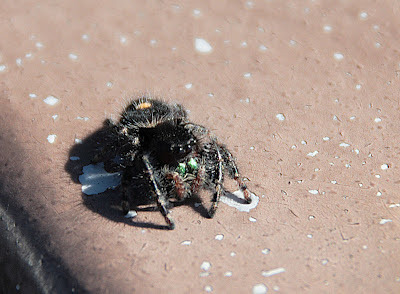 One summer we had a black fuzzy with emerald green fangs who took up residence in the kitchen. Every morning as the household awoke and greeted her, she would would lift her 'arm' and wave... a marvelous trick by any standard. There is an entire psychological phobia named after fear of spiders called Arachnophobia. So popular is this fear that comic book creator Stan Lee embraced it, introducing an irresistible spider hero in 1962. Spiderman instantly became an all time favorite! The Dry Sahara... the hottest place on Earth. As the summer typically heats up, those who garden are dependent upon water to keep all our treasures alive. However easy it is to simply turn on the hose, the washer, the dishwasher, and the tub, it is only within this generation that a belief emerged that water was a constant, never ending gift. It is not so and thus we must evaluate our use and misuse of this precious commodity, which is more valuable that diamonds or gold. Water is stored underground and goes through aquifers to reach the surface. An aquifer is a body of saturated rock with hills and valleys which filter and store water… some have water and some do not. If the rate of recharge is less than the rate of discharge even the ‘valleys’ with water will decline and their aquifer storage may decrease from drought or over use. With the global population explosion water use has decreased aquifers throughout the planet. An example is Saudi Arabia who had one of the greatest and oldest freshwater resources… the nation has used four-fifths of its store of fossil water in little more than a generation. They have invaded parts of Africa to ‘steal’ water and there is an ongoing war with the Indigenous people with the locals losing the battles. 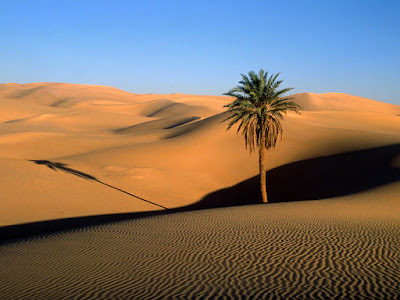 The Sahara Desert encompasses most of North Africa and as we have seen recently the sand from it arrives here almost weekly, making a choking haze from Houston northward while here we have the Mojave Desert in S.E. California and W. Nevada. At home, there is a water crisis in California, New Mexico, Arkansas, Oklahoma, Missouri and Utah. Much of our water use is in the commercial production of chickens, hogs, and almonds where millions upon millions of gallons are used each day. Hershey’s bottled water comes from a secret (yet publicly owned) spring in California which is so well hidden that it may be reached only by helicopter… it is an intrigue which borders on criminal as the state suffers. A global graph places water usage at 1,000 gallons per person per day… which seems an unsustainable rate by any standard. In third world nations where water must be hauled great distances, it is carefully reserved. The gentleman who researched water use found in the Middle East, women (not their husbands) knew exactly how much was used for drinking, cooking, bathing, and watering their goats and it was an astonishing low of 2,000 gallons a week. Following the Dust Bowl, Michael’s grandmother recycled water constantly by pouring the dish or bath water on the garden, which seems extreme by today’s standards. But we can use a soaker hose, turn off the constantly flowing water in the kitchen, shower quickly, and realize the old adage ‘Waste not, want not’ is a truism. We can do better at preserving this precious, life-giving gift we have been given…for future generations, we simply must. Years ago as I was waiting in the car at Auto Supply I noticed a gorgeous vine twining about a fence adjacent to the alley. The vine had lovely leaves which were veined with deep purple and the exquisite pink and lavender flowers crawling along the tendrils resembled tiny orchids. Electric purple bean pods were scattered throughout the mass of leaves and flowers creating a stunning display. Thus was my introduction to Hyacinth Beans. When I rang his door to tell the gardener of my admiration and inquire about them, he gave me an overly generous bag of seeds which were absolutely adorable... they are black, brown, or speckled with a half circle of white at the joint making them smile! This species of bean has been grown in India since ancient times and is cultivated for its seedpods as well as the leaves which are eaten like spinach. In India the beans are highly desirable for their protein content but since they also contain a toxin or two, recipes for preparation are intricate and not recommended. For this reason, they are now considered an ornamental rather than an edible bean. The plants come up in the garden within a week, bloom within twenty days, have a high heat tolerance, and will travel over twenty feet in a single season. Planted on the fence, the light pole, or anywhere one desires a charming screen, this vine is truly a remarkable joy. Another climber is the magnificent morning glory. They are an ancient flower that has been traced back to China where they were used for medicinal and ceremonial purposes. The Japanese first cultivated the flower for ornamental use in the 9th century and it is celebrated in both culture and art. Artifacts indicate that over three thousand years ago, many South American civilizations had discovered adding morning glory seeds to the substances from the rubber tree produced a bouncing rubber ball. The sulfur in the seeds was the key and the ancients used the exact same process supposedly ‘discovered’ by Charles Goodyear for his tires in 1844. Besides the traditional blue there are many new varieties in an astounding array of colors making this charming vine a welcome addition to any garden. With drought and poor soil tolerance, rapid growth habit, and amazing twining ability, the morning glory has long been used to shade porches... the ease for climbing a trellis provided cooling relief on hot summer days. *Collection and storage of the seeds is economical however it should be mentioned the seeds contain a hallucinogen... thus the seeds must be stored away from children and pets. As Summer continues her delightful pace with children out of school and spending time outdoors, a refresher course about poisonous plants is beneficial... many of their properties are disguised by their loveliness. Plants have been source of fascination since the beginning of time and have provided a multitude of benefits to mankind, however there is a dark side to the plant kingdom and many plants are extremely deadly. The science of producing poison from plants reached a zenith during Medieval times when dispatching an enemy was as easy as brewing an untraceable tea. Letters laced with toxic ricin were reportedly mailed to government officials several years ago placing plants at the top of the political news. 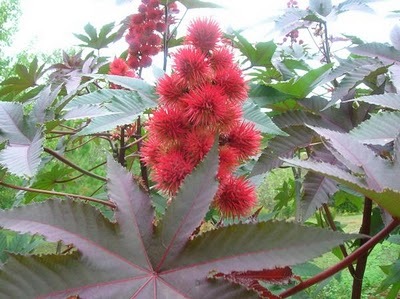 Ricin is made from seeds of the castor bean, a common plant which has long been used to eliminate gophers from the garden. Many toxic plants incur cult followings among ill informed youth. Used as a recreational drug due to hallucinogenic properties, the exotic Moon Flower made the news when high school students chewed seeds in class. The beautiful Salvia Divinorum contains a property which is a potent naturally occurring hallucinogen when smoked. The leaves were used in traditional spiritual practices by the native people of Mexico however due to its ‘popularity’ among non-native followers, it has been banned in twelve states including Florida, Louisiana, Missouri, Tennessee, Delaware, North Dakota, Illinois, and Ohio.